and tucked a cobalt blue vase with a bird design (given to me by a friend) between them. My tall candlestick which seems to be a staple on the mantel flank the plates. 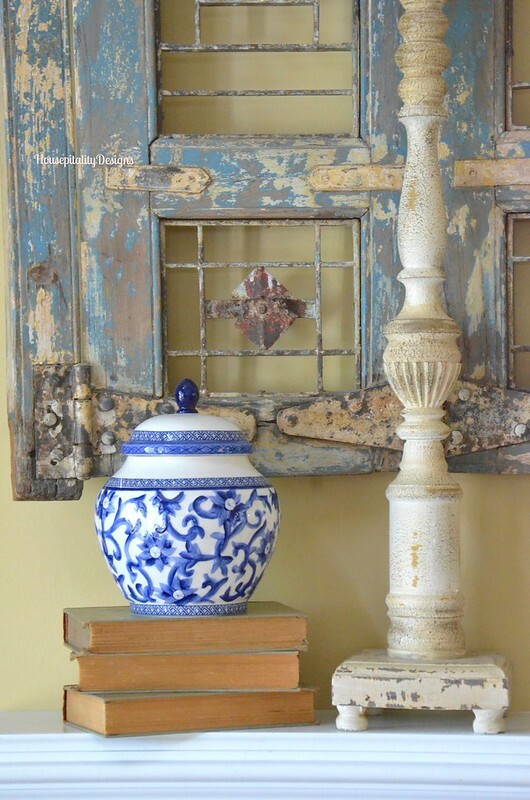 Blue and white Ralph Lauren ginger jars are placed at each end of the mantel. I guess I could say that I wanted a very symmetrical look for the mantel. 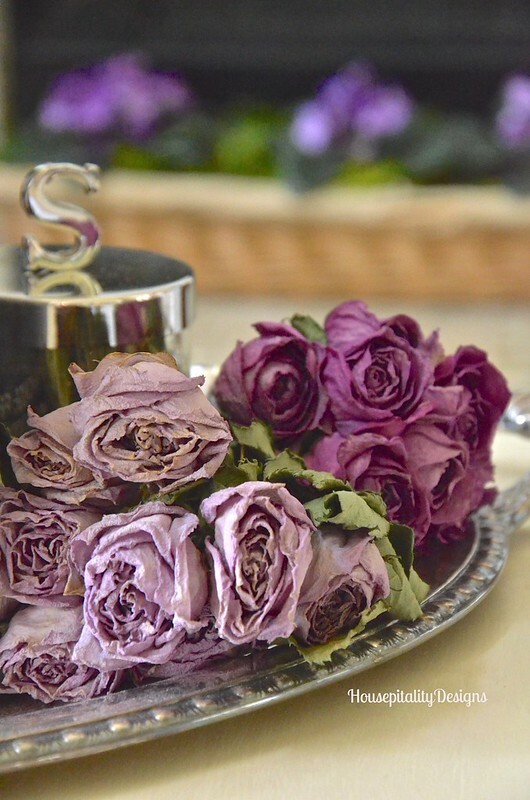 I have used these items on the mantel in many different ways and areas of the house. I added some lavender African Violets to the antique French bread basket. my friend Merry and I headed to Pottery Barn while the guys were playing in their practice rounds. We scoured the clearance tables and I found this pretty blue throw on clearance. Perfect color! I was very happy to see the throw blend so well with the blues in the room. I think the coffee table will be next on the agenda to add a bit more Spring to the room. Hope you all had great weekend and a Happy Easter. cooking Easter dinner for my family. Truly a busy and fun filled weekend. Have you started your Spring decorating yet? i just love those plates, they are so beautiful! that pollen is kicking my porch’s you know what! not even motivated to set it up for spring quite yet. i hope you had a lovely easter. Shirley, your whole house is beautiful would love to see a post on the colors you have used and the name of the paint company!!! Thanks Julie….the wall color in the room is Sherwin Williams Blonde. I love those plates and what a great score on the throw! Have a wonderful week! 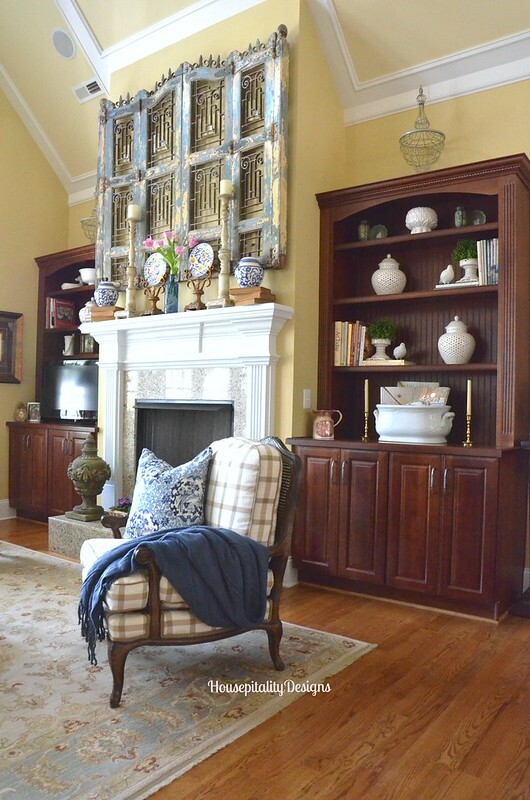 Shirley, I have always loved symmetry and your mantel is the perfect example! The pollen is terrible here and my kitchen porch is that yellow-green shade ! Happy Tuesday! Pam Richardson’s recent post…Tablescape Tuesday: Simple and Spring-y! Looks great. How nice to luck up on that blue throw. Works perfectly in this room. Yes, the pollen is awful this year. I can’t wait till it passes so I can work outside. Your mantel is beautiful, Shirley! 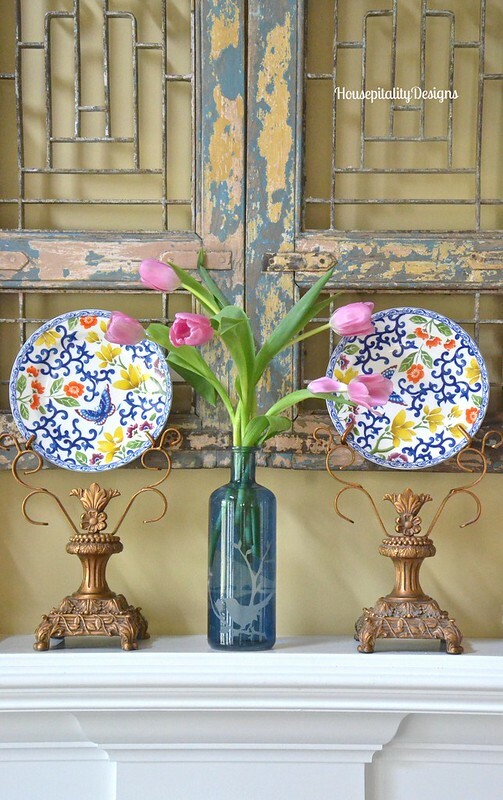 I love the colors in the plates with the tulips. The throw was a great find. I need to shop with you! Happy Spring! So simply elegant! I love those plates and especially the plate HOLDERS! They are one of my favorite things that you have! I am going to go to our PB outlet and look for a throw, I have been searching for a blue one since after Christmas! Your weekend sounds like it was exciting and fun filled! Beautiful Shirley!! Those plates are amazing! Pollen is crazy here, so as usual, I will wait until end of April to pressure wash and get the porch ready. Shirley, you’re mantel is just gorgeous. I love how your able to combine so many individual pieces and make them work together so seamlessly. 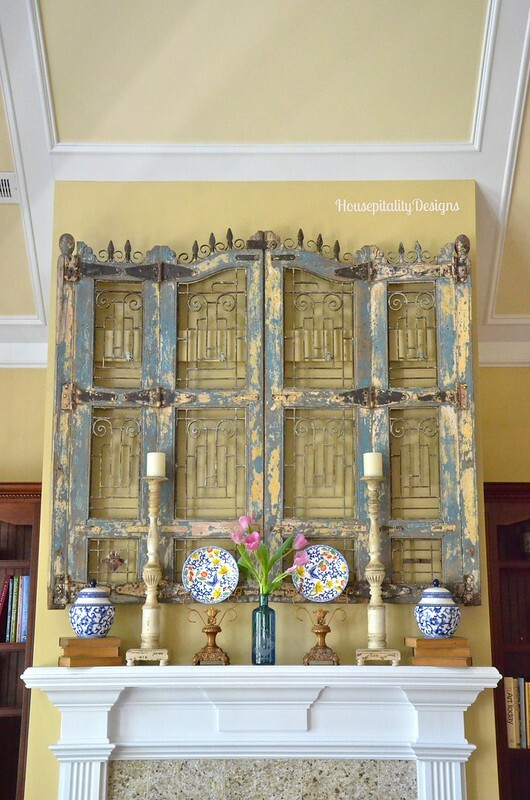 The distressed wall hanging is grand. What a find. Hope you had a nice Easter holiday. 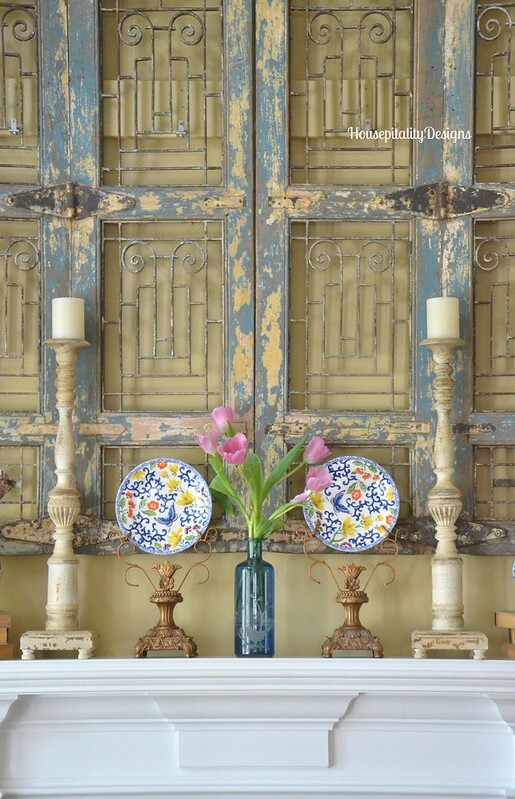 Beautiful Spring Mantel. I love the African Violet addition. Love it all! 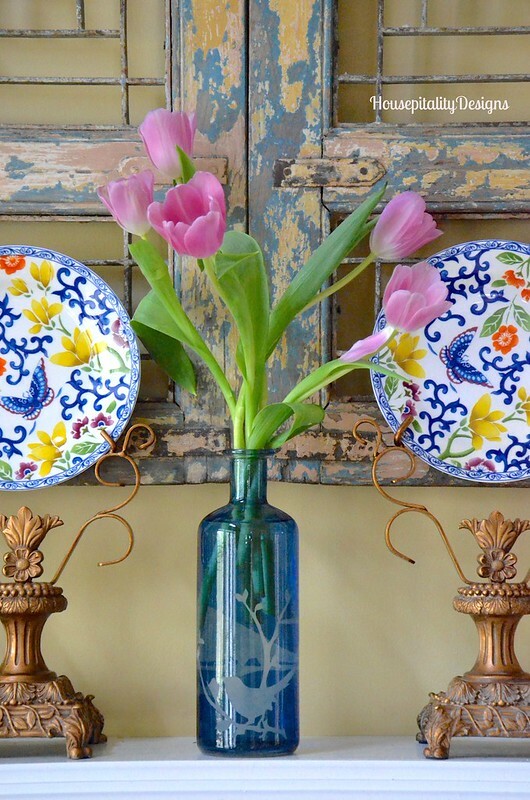 The plates are so pretty and perfect for a spring mantel. I like you am so ready to do some porch decorating and totally forgot about the pollen in the south. Hoping you are right and it will be out of here soon. 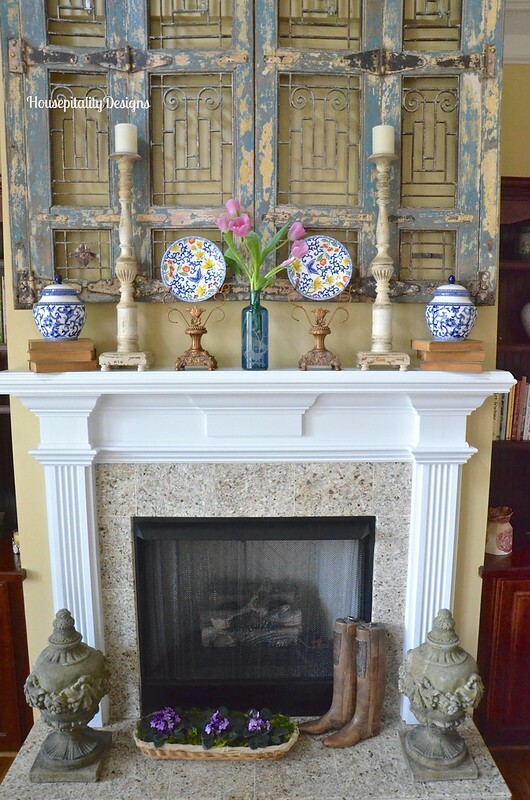 Your spring mantel looks lovely! I actually have my blue and white on my mantel right now, but I have a little more tweaking to do before I share. We have a big pollen issue here now as well. The colors are beautiful together!!! 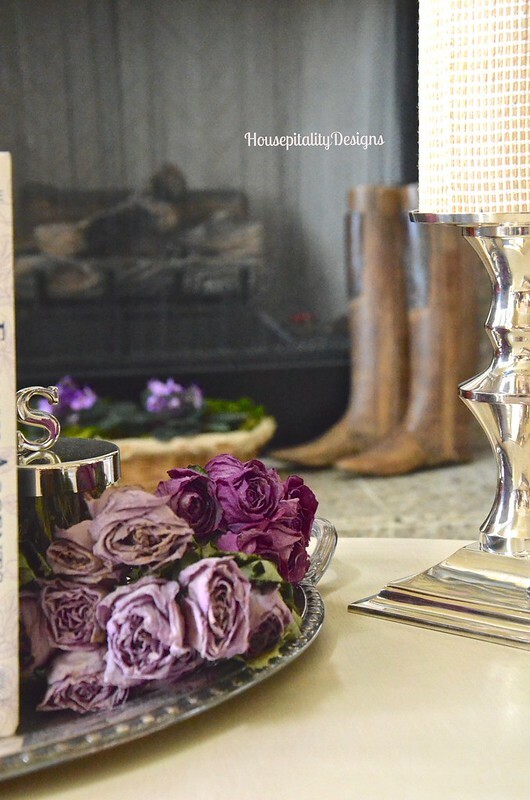 Love the spring touches on your mantel, Shirley. The blue is amazing there and your new throw is just perfect! Your spring mantel looks so pretty! You are a little ahead of us,so no pollen here….yet! The beautiful plates are so eye catching! What a lovely etched blue vase to compliment your arrangement. Doesn’t it seem to add so much meaning when we add a friend’s gift to our decor? I feel that way. It makes me thankful each time I look at it for the gift and the giver. You, no doubt, treasure things like that too. You say much about yourself by showing us your welcoming style. Thanks, Shirley. Shirley, your mantel is amazing! I love the blue you’ve added in the room and it goes with your screen so well. 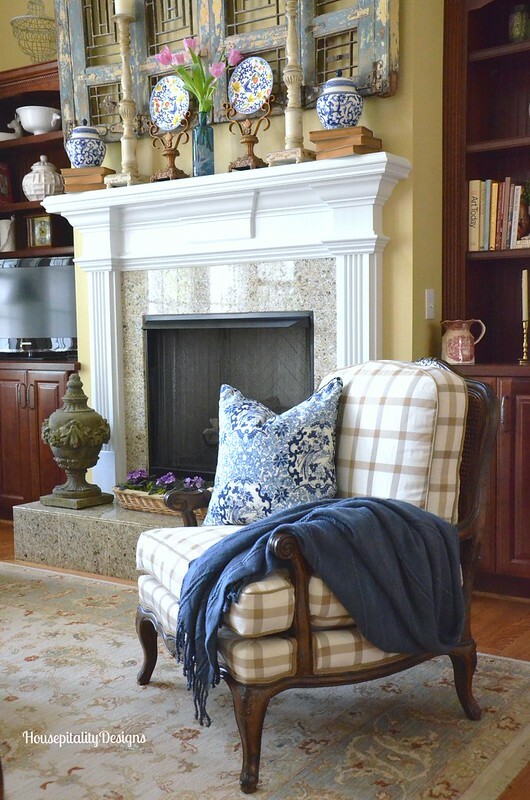 How beautifully your mantel transitions from one season to another. I especially like this arrangement. Am I just now noticing the boots or have they been there? Though pollen season isn’t quite over I tackled our screen porch yesterday so that we could eat out there. I don’t want to miss this time of year when it is so pleasant. The mantel looks beautiful, Shirley. And of course I love anything Ralph, and I have got to find me a pair of those wooden boot inserts! How pretty, Shirley! 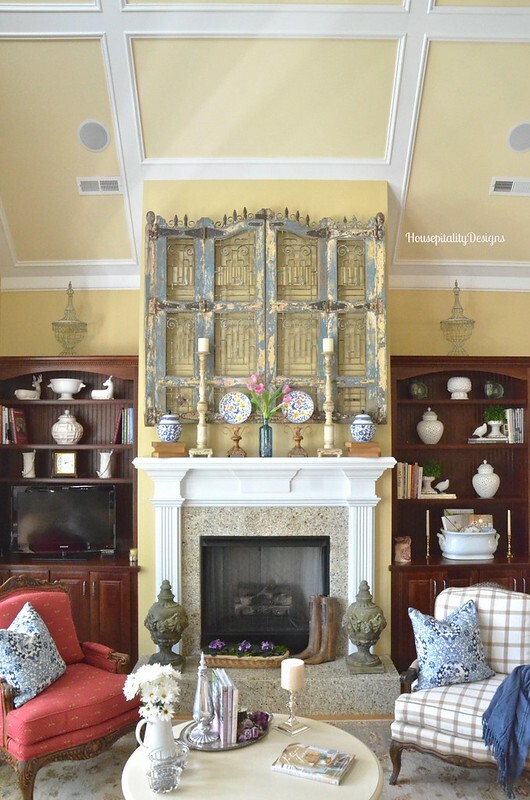 I love how you’ve dressed your mantel and those colorful plates are darling! Your entire home is just beautiful! Have a blessed day. Nothing says spring better than a pop of bright colors! Beautiful Shirley! Shirley, your mantel looks so pretty! I am enjoying all of your spring posts! I am working on my Louisiana house; and I have gotten so many great ideas from you! Keep ’em coming! Your mantle looks very lovely. Everything says SPRING. You really have a knack for putting things together. Great job.